The first book introduces us to Atticus O’Sullivan, at first glance he is a trendy twenty-something, with tats, speaking in slang, that runs an occult bookshop. But, really Atticus is centuries old, the last ancient druid. Kept alive by spells, with and a few pacts with ancient death goddesses. In this first installment, we are introduced to a preexisting issue that has haunted Atticus for centuries. In Atticus’ early days he enjoyed battle, like most men of his time and found himself in possession of a magical sword, Fragarach, after a particularly noteworthy battle. The problem was, a member of the Tuatha Dé Danana, a particularly nasty god of love, Aengus Óg believed the sword was rightfully his. Over the years, Aengus sent his followers to occasionally try to kill Atticus and take the sword from him, but none were successful, and Aengus himself never came knocking. Unfortunately, now, things seem to have changed. Aengus is now determined to get his sword back, for unknown reasons…and it might just lead to Atticus’ death. Because, how can one defend themselves against a god? 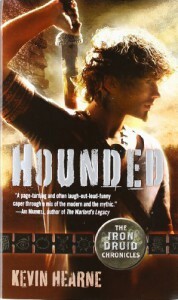 The first book, Hounded, was a joy to read/listen. The main character Atticus and all the great side characters just make this story. Atticus is a phenomenally constructed character. He possesses a great sense of humor, snarky one-liners, an up-beat personality and an underlying sexiness, without all the male machismo that you find in some alpha-characters. Atticus is just a very well-rounded character. Then you sprinkle in the great secondary characters, from Atticus’ werewolf and vampire lawyers, to his fun Irish neighbor, the Widow McDunna (who was my absolute favorite side character – I could just imagine her as a real person, talking about how she had to drink her Whiskey before church) and even his talking wolf-hound, Oberon was a great addition to the book. The plot was also very fast-paced and full of interesting tid-bits about the Celtic pantheon. We are introduced to the ancient Celtic gods, The Morrigan and Aengus along with a few others that I have never read in fiction books before, even though I’ve read considerable urban fantasies that cover the Tuatha Dé Danana. It showed some great research by the author and gave the novel real-world depth. It made the book that much more enjoyable and why this is a Parajunkee’s View series pick.